Where is the increasingly vituperative spat between Turkey and The Netherlands (and other EU countries) going to lead? Why is this political fall-out between fellow NATO members happening at this precise moment? First, a quick recap of the events. At the weekend, two high-ranking Turkish officials were prevented from speaking at political rallies in The Netherlands. The Dutch authorities barred Turkey’s Foreign Minister Mevlut Cavusoglu from landing in Rotterdam, while Family Minister Fatma Betul Sayan Kaya was prevented from entering the Turkish consulate, and was then deported. Ankara’s reaction has been furious, with Turkish President Erdogan giving a stern warning to the Dutch while likening their actions to Nazism. The Dutch will “pay the price” for its “shameless” treatment of Turkey’s minister, President Recep Tayyip Erdogan said in a strongly-worded statement. He also urged international organizations to put sanctions on The Netherlands. The Dutch hit back with PM Mark Rutte demanding Erdogan apologize. The Danes and the Germans have also weighed into the dispute. The Danish PM has postponed a planned meeting with his Turkish counterpart, while the German interior minister has said that "a Turkish campaign has no business being here in Germany." 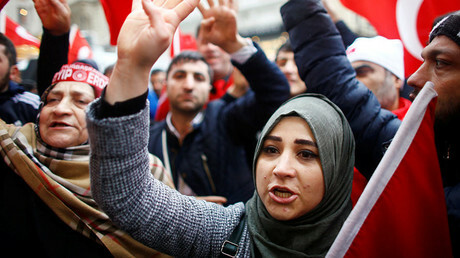 Europeans have cited security/public safety concerns as their main reason for banning or preventing pro-Erdogan rallies in their countries ahead of Turkey's constitutional referendum of April 16th. There’s also been criticism of the government crackdown which followed the coup attempt of last July. If ‘Sultan’ Erdogan wins the vote next month, he’ll have sweeping new powers and could stay in power legally until 2029. But are fears over security and democracy really the reason why EU leaders, have all of a sudden gone off their Turkey? Whatever one thinks of Erdogan and his government (note carefully how it’s now referred to as a ‘regime’ by Western chick-hawks), the Dutch actions do appear to be in clear breach of the Vienna Convention on Diplomatic Relations. Also, if 'democratic concerns' are the issue, it seems a strange way to respond by banning people from addressing political rallies. And where, we might ask, were those "democratic concerns" when the Turkish authorities forcefully clamped down on protests in 2013? As I pointed out on RT at the time, leading Western political figures were as quiet as church mice. It’s interesting to contrast today’s custard-pie slinging with how amicable EU-Turkish relations were only a short while ago. 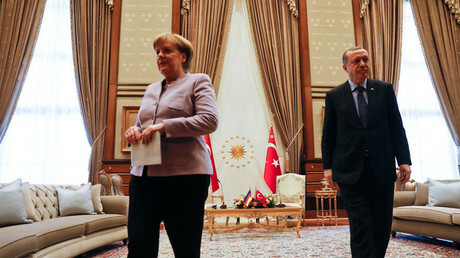 In October 2015, the ‘Queen of Europe' aka Angela Merkel sat alongside ‘Sultan’ Erdogan on a golden chair in the Presidential palace in Ankara and gave out various promises regarding Turkey's bid to join the EU. The visit, just two weeks before Turkey’s general election, provided an undoubted boost to Erdogan’s campaign. It came shortly after Turkey’s leader and his wife Emine had been hosted to a banquet by ‘Their Majesties King Phillipus and Queen Mathilde of the Belgians’, in Brussels, on a trip in which Erdogan was also greeted warmly by EC President Donald Tusk. Since then there’s been quite a bit of water under the bridge. Various respected commentators believe Turkey’s new rapprochement with Russia, particularly over Syria, is the main reason why the EU’s stance has changed so dramatically. It’s certainly interesting to note how the Western party line on Erdogan seems to harden whenever Turkish and Russian leaders get together to discuss closer economic/military co-operation (as they did in Moscow only last week), and how, conversely, democratic concerns seem to evaporate when Ankara is at loggerheads with the Kremlin. Erdogan’s pledge to support Syria’s territorial integrity, and his opposition to the country being Balkanized would not have gone down well with those who want to see the Arab Republic cut up into little pieces. Even though he doesn’t mention Turkey explicitly in his new book, ‘The New World Order in Action, Globalization, the Brexit Revolution and the Left,' the Greek left-wing writer Takis Fotopoulos helps us to understand very clearly what’s going on. 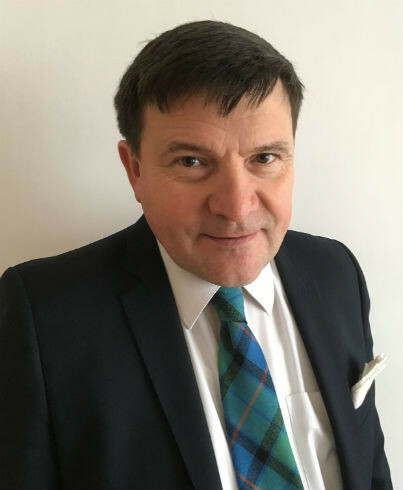 His thesis is that the transnational elite, which consists of a network of economic and political elites mainly based in the G7 countries and acting in the interest of transnational corporations and global capital, have as their aim the full integration of every country in the world into the neo-liberal New World Order. Any countries which resist this integration - e.g., Yugoslavia, Iraq, Libya, or Syria - are targeted for regime change or destruction. 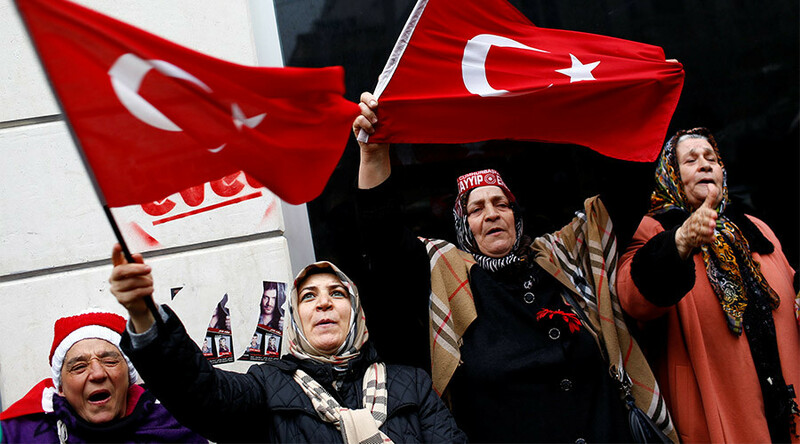 Turkey is partially integrated, as a member of NATO, but is still something of a loose canon. The promise of EU membership, in return for other favors such as restricting the flow of refugees into Europe, is held out as a carrot to keep Ankara on the straight and narrow. But there's a snag that's as large as one of the minarets of the Blue Mosque. The transnational elite support liberal immigration policies and 'free movement' of people in EU countries. That’s not because they’re peace-loving, Blue Mink-playing hippies, in favor of the international brotherhood of man, but because of the downward effect on wages (and the consequent upwards impact on profits) that large-scale immigration leads to in an era of weakened trade unions. However, public opinion in countries ruled by the transnational elite has, at a time of austerity and considerable economic hardship, turned sharply against liberal immigration policies, with voters increasingly attracted to neo-nationalist parties of the populist right, some of whom espouse Islamophobic sentiments quite openly. The bottom line is that political leaders/potential leaders backed by the transnational elite, such as Mark Rutte in The Netherlands, Merkel in Germany and Emmanuel Macron in France, face stiff challenges from the likes of Geert Wilders, the AfD party, and Marine Le Pen in 2017. Consequently, they need to be seen, at least in the weeks before their country’s elections (the Dutch general election is March 15th) to be taking a more nationalistic stance, in particular over the Muslim presence in Europe and the 'threat' of Islam. So from their viewpoint what better issue to take a stand on than political rallies held in Europe for Turkey’s Islamist President, especially since he’s getting all friendly with the transnational elite’s number one bogeyman: Vladimir Putin. Right on cue, the globalists’ favored French presidential candidate, the former investment banker and so-called "centrist," Emmanuel Macron, has come out and called for France to support its European partners and "reject the Turkish government’s abuses," which he said target "European values." However, this deeply cynical strategy of bashing Turkey to gain domestic electoral approval could easily backfire. If this were a game of whist, and clubs were trumps, then Erdogan is holding the ace and king, while the EU leaders, for all their new-found outspokenness, are only holding a seven and a five. Erdogan’s ace is the threat to open Turkey’s borders to allow millions more refugees to enter Europe. He did, in fact, make that threat last November if the EU blocked membership talks. A new big influx of migrants is likely to propel Marine Le Pen to the Elysees Palace and end Merkel’s reign in Germany. Erdogan’s ‘king,' as it were, would be to move even closer to Moscow and announce that he was planning to "review" Turkey’s membership of NATO. That would also cause panic in Western capitals. Expect more of the same sort of pieces in neo-con publications in the weeks ahead. But remember, this, like ISIS/Al-Qaeda terrorism, is a ‘problem’ of the Transnational Elite’s own making.